Is Raimi trying to replace ABC/Disney? A few weeks ago, one of our users, lafouine152, wondered if the series was canceled. We told him we would ask you the question. Can you answer? If you want to read the article directly, and you don’t read French, you can use sites like Babelfish and Google Translate to do so. Google’s Chrome Browser automatically offers to translate pages when it detects a foreign language. Bridget has been quoted before as saying something about they are looking for a new producer. And that has caused some confusion for people. If Sam Raimi and Rob Tapert are the show’s producers, then why is ABC Studios the Production Company when Raimi/Tapert’s Renaissance Pictures is the Production Company? The answer is simple: it’s simply complex. I once asked Steve Sears (Co-Executive Producer on Xena: Warrior Princess) why everyone seemed to have “producer” in their title. Did they all do the same thing? His answer was complex (but simply put is thus): “Producer” is a title that is applied to various tasks associated with producing a show. Some producers are writers; some producers are decision-makers; some producers are primarily money men. So, yes, there are different types of producers and production companies often come together to collaborate on television shows and movies and all sorts of entertainment productions. Don’t worry about why everyone seems to be a producer or who owns the rights to what. The bottom line here is that people are still interested in putting the show back on television — but they are apparently having to make new arrangements. Whether Disney/ABC is trying to find someone to buy its interest in the property is a question to which I don’t have the answer. It doesn’t sound to me like Raimi and Tapert want out of the Seeker production business. Maybe SyFy wanted to buy ABC’s interest, maybe not. Maybe the rights are on the auction block, maybe not. I do know that production companies don’t always buy permanent, irrevocable rights. Sometimes there is some sort of reversion or expiration clause in these kinds of contracts. So, far example, the rights to the “John Carter of Mars” movies (based on the Edgar Rice Burroughs novels) have bounced around from production company to production company every ten years or so — whereas the rights to movies (and everything else merchandisable) based on J.R.R. Tolkien’s The Lord of the Rings and The Hobbit are permanently owned by the Saul Zaentz Company (which manages those rights through its subsidiary Tolkien Enterprises, which has nothing to do with with the Tolkien Estate or the Tolkien Trust, which are owned by the Tolkien family and administer all other rights to the Tolkien canon). So, I hope that clears things up for you. It is starting to sound to me like there is “hope” for the Seeker but that it will probably take time to get everything sorted out. We should continue to show our support for the show, the cast, and all the production companies even if Disney/ABC are now trying to transition out of the picture. 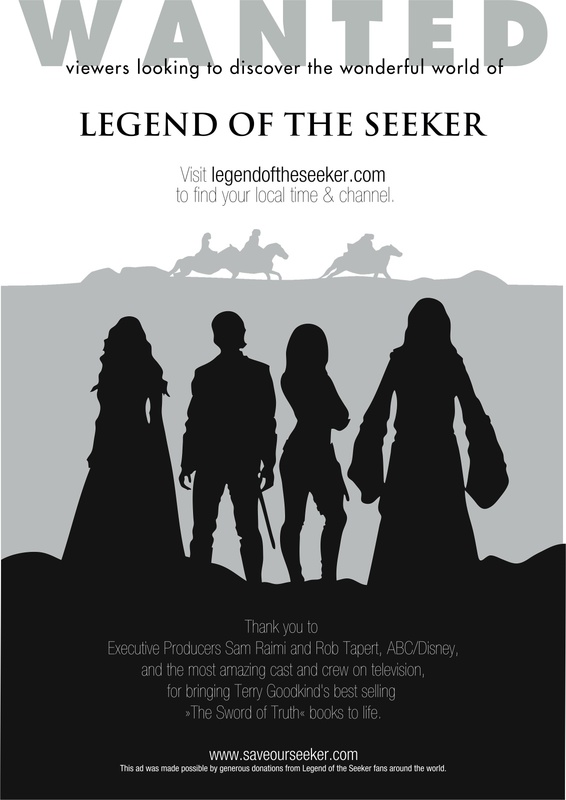 Posted in Seeker News | Tagged abc studios, disney, legend of the seeker, renaissance pictures, rob tapert, sam raimi, save our seeker, save the seeker | Comments Off on Is Raimi trying to replace ABC/Disney? The Save Our Seeker advertising campaign rolls on with the promised advertisement in the bus shelter/stop across from ABC Studios now live. LOTS.org forum user oicaxf uploaded this picture of the ad. It’s here at last! The TEASER for the International Seeker Fan Video Project! What, you didn’t know there would be a teaser? Neither did I. So what? Watch it! It’s funny! Save the Seeker — because otherwise we’ll have to create MORE of these great videos, and you have no idea of how creative the fan community can become when it gets frustrated. ABC Studios and Disney, please don’t make us frustrated. You wouldn’t like us when we’re frustrated. Oh yeah, I feel a burst of Gamma Radiation coming on! sot_fan posted the following update at LOTS.org’s forum for the Save Our Seeker campaign. Our SOS campaign ad will wrap a bus shelter in Burbank, CA in proximity of the major studios (intersection of Hollywood Way & Verdugo). See image. Best part: the ad will be featured at this bus shelter for an entire month, starting June 7th through July 4th. The total cost of the ad is $475. Links to contract: page 1, page 2. Double high five & standing ovation to @tarlanciel for the beautiful graphics!!! Please send us a picture of the bus shelter if you’re in the area: contact -at- saveourseeker -at- com (NOTE: See image below). We’re working with the same agency to explore advertising opportunities for billboards in San Diego during Comic Con (July), and more in Burbank (August). Also working on some other opportunities for DragonCon in Sept. Basically, one big ad every month would be ideal funds permitting. Updates are being posted in this LOTS.org forum discussion and elsewhere (in fact, it’s impossible to keep up with them all — sorry). This is the advertisement that will run at an LA bus stop near ABC Studios from June 7 through July 4. 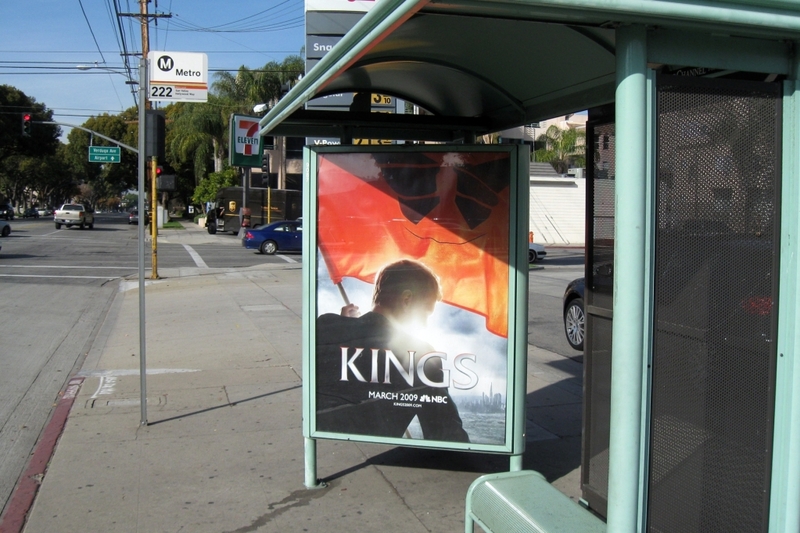 Picture of the bus stop where the Save Our Seeker ad will be shown from June 7 through July 4. DONATION TOTAL UPDATE: $11,398. Incentive (@Terrygoodkind1 signed DVDs) donations made by June 5th will still qualify. We received a couple of emails via contact -at- saveourseeker -dot- com suggesting DVD donations to troops overseas, and we can easily make it part of the DVD-Library drive. Donations are still being accepted for the DvD drive at this time. And it looks like from a comment sot_fan made elsewhere that they are thinking about the billboard ad if they can raise enough money for that. Hope I have now caught us all up, but if not, please feel free to add more details in the comments. Thanks! Now, let’s SAVE OUR SEEKER! ABC Studios and Disney — DO YOU HEAR US NOW? So have you been wondering whatever happened with this project? LOTS.org forum user classymissm posted a couple of updates to the forum discussion about the project. Hey guys! We are very close to having it done. Just bare with us for a little longer. We are as excited about the video as you guys are and are hoping to have it ready within the next couple days. We got about 26 submissions, which gave us a video close to 7 minutes long. I’m looking forward to seeing this video. Hope you all are, too. ABC Studios and Disney — we’re out to Save The Seeker. How about you?